Our newest youth guest contributor for Get Wet Sailing shares the second half of his story, his love for Hobie sailing and how he built it up in his community. When I noticed that the Hobie 16 was for sale, I almost started to cry. That is how attached I was to Hobie sailing at the time. I was trying to find the easiest way to afford that boat. I ended up selling one of my guitars to afford the 500-dollar boat. I met up with the yacht club board, and bought the boat. I was so happy! I spent every Saturday, Wednesday, and Friday on the water for a whole year. I ended up meeting these boys from a local school, named Chase & Adam, at the lessons. I started teaching them because I wanted to share my love of sailing with them. They joined the club, and I immediately asked them if they would be interested in sailing the 16 with me. They jumped on board and as of that night, Team Contraband was born. They got their own boats, and we started to plan our own races. With their help, we got another 6 people interested in sailing with us. 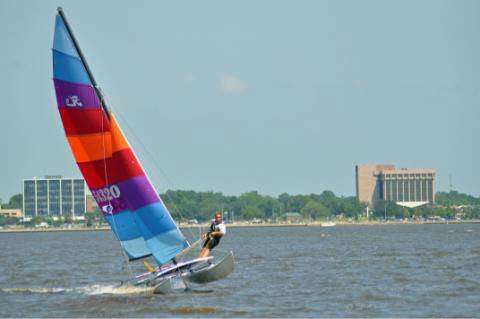 Team Contraband was at first just 2 club Hobie 16s that needed a lot of work. In the winter of 2012, we worked on repairing those boats. We worked so hard in fact, that I was covered in gel coat and fiberglass 24/7. It all paid off. Today we have a few more new members and Team Contraband is now 3 Hobie 16’s, 1 Hobie 14, and 1 Prindle 18.2, and a few chase boats. We race around, tie them together and make barges, and just sleep on the trampolines for a quick nap. There is nothing better than the feeling of hooking to that wire, grabbing the sheets & hiking stick, and pushing out and getting the feeling of flying and adrenaline rushing through your body. I have gone from one sailor to many in my town. I have basically lived at Lake Charles Yacht Club for the past 3 or 4 years.